You may never clutch your chest in agony. Here are a few heart-stopping statistics for you: According to Go Red for Women, a division of the American Heart Association, cardiovascular diseases affect an estimated 44 million adult females in the U.S. They cause one in three deaths in women each year, and approximately every 80 seconds, one woman dies. "Heart disease is the number one killer of both men and women," says Nisha Jhalani, M.D., director of clinical and educational services at the Center for Interventional Vascular Therapy at NewYork-Presbyterian/Columbia University Irving Medical Center. "Men know this — men identify heart disease as their number one killer — but women shockingly do not. But if you describe heart disease as killing more women per year than all forms of cancer, diabetes, and lung infections combined, it's very humbling." 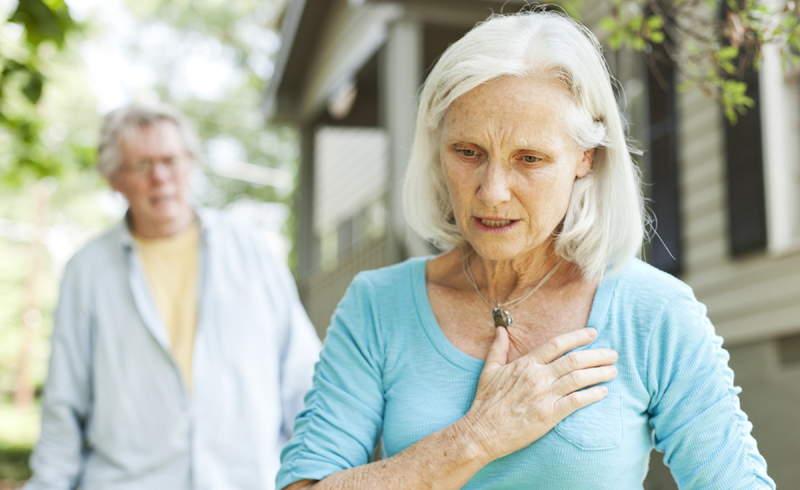 While everyone knows about the telltale signs of a heart attack — tightness in the chest, pain down your left arm — there are other symptoms that could indicate a heart attack is about to hit you full-force. These are the most common signs of a heart attack in women, all of which could be present on their own or together, Dr. Jhalani says. If you experience any of them, get to the closest emergency room as soon as possible. Your chest feels like it's been sucker-punched. "When we think about heart attacks, we picture somebody who has a sudden onset, fist-clutched-to-their-chest-type moment," Dr. Jhalani says. It's what's known as an ST-elevation myocardial infarction, and it happens when the blood supply to the heart becomes obstructed. "I call it the TV heart attack," Dr. Jhalani adds. "It's an acute heart attack, meaning a vulnerable plaque in the heart ruptures and is now 100 percent blocked." When this severe chest pain hits, it's imperative to get to the emergency room as quickly as possible because the heart muscle continues to die with each passing minute, Dr. Jhalani explains. If the pain dissipates, that doesn't mean you're in the clear: In women, it's common for the squeezing sensation to last for minutes, disappear, and then resurface. Your upper body feels sore. Your chest isn't the only place you could feel pain during a heart attack. Symptoms could also appear in your left arm, jaw, and even your back, Dr. Jhalani says. People often describe these sensations as unusual pressure, soreness, or tightness though, rather than a painful, chest-clutching moment like the one mentioned above. Which means that these atypical symptoms may be subtle at times, and they could last anywhere from a few days to a few weeks. Dr. Jhalani says it's essentially a precursor sign of a heart attack, signaling a growing presence of plaque in the arteries. "While this blockage is not yet causing a heart attack, it's [reached] a critical point," she explains. Visiting the doctor before things get worse could be the move that saves your life. Your digestive system is way off. "In women, oftentimes nausea and abdominal symptoms, like vomiting, are the presenting signs of a heart attack," Dr. Jhalani says. And although people may question the difference between having an upset stomach due to a virus or acid reflux and having stomach issues due to a cardiac event, she says that the answer lies in how you describe the discomfort. "Everyone seems to say that they just felt different and knew something was off," she emphasizes. "I have a saying with my patients: 'Different matters.'" 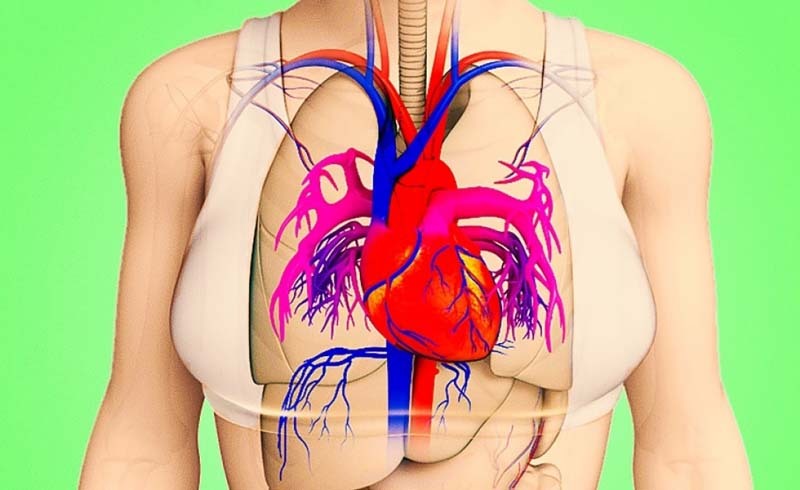 The inability to catch your breath — with or without chest tightness — is another common sign of a heart attack in women. "This would be profound shortness of breath that is out of proportion to anything [you're] doing, [like] no longer [being] able to go up a flight of steps without being winded," Dr. Jhalani says. It's an indicator that something is happening with your heart or your lungs, so it's time to get the situation checked out. If you're not usually a sweaty person, random profuse sweating that isn't related to heat or hormonal changes is a big sign of a cardiovascular episode, Dr. Jhalani says. "This is especially true if you're sweating — or having any of the other symptoms — at rest or with less and less excursion," she adds. It's also important to take your emotions into account. Are your kids going through the terrible twos? Did you start a new job? These are times that you may want to focus on self-care, as Dr. Jhalani notes women are more likely to experience heart attack symptoms during times of stress. You're exhausted all of the time. You know what it feels like to be tired, even exhausted, but just like the other subtle signs of a heart attack in women, this type of fatigue would feel different than your usual level of tiredness, Dr. Jhalani says. It's likely that it would actually feel overwhelming, and it could result in a decrease in the amount of activity you're able to do, she adds. It's common for this sign — and some of the others — to be mistaken as a symptom related to anxiety, but if you truly feel like that's not the case, speak up. "Research has shown that, even once women have been diagnosed with having a heart attack, they are less aggressively prescribed medications by physicians," Dr. Jhalani says. Which means that it's imperative you advocate for yourself. "The longer you sit at home and try to discount your symptoms, the more damage that is happening to your heart muscle," she says. "If you think something is going on with your heart, the most important number to remember is 9-1-1." After all, it's better to be safe than sorry.